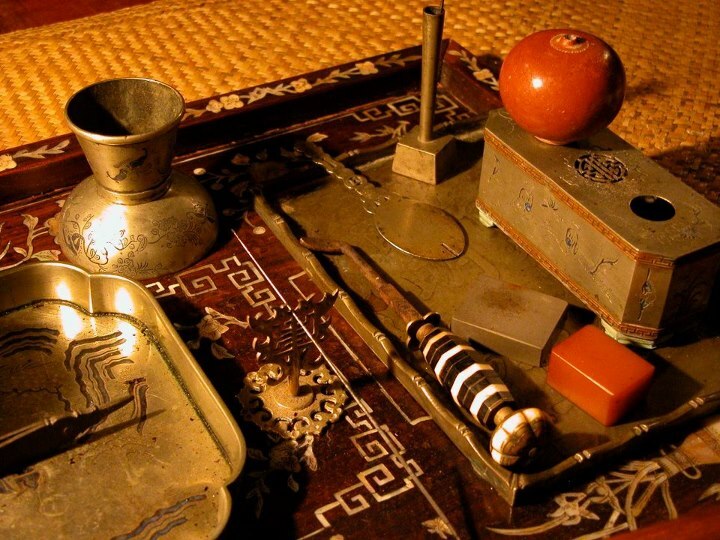 There, he also discovered the beauty of antique opium pipes, bowls, and lamps, as well as opium trays and the hundreds of little implements that went with the ritual. Because opium smoking had been so thoroughly eradicated around the globe in the early 20th century, Martin realized very little had been written about these objects. After years of intense research, he produced the first opium-smoking antiques guide, The Art of Opium Antiques, in 2007. Top: Anti-opium propaganda poster from China, circa 1930. 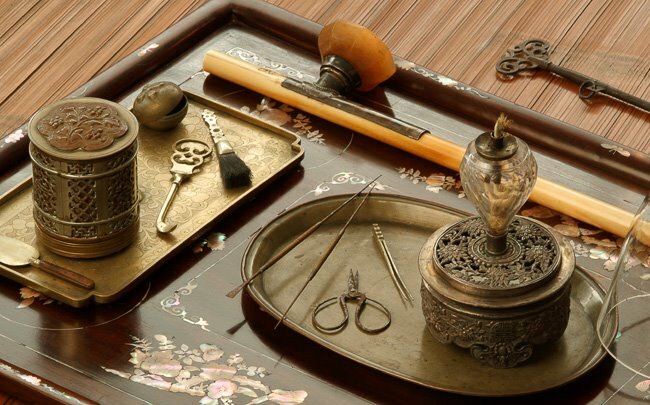 Above: This Vietnamese smoker’s layout included a hardwood tray with mother-of-pearl inlay and miniature, spittoon-shaped pots on which to rest pipe-bowls. 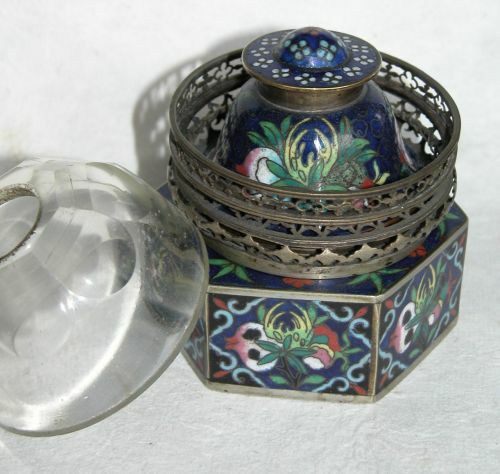 Collectors Weekly: What drew you to antique opium paraphernalia? An example of an opium tray and accoutrements. The metalwork is designed to reflect the lamp light. Steven Martin: There was something dark about it. People collect all sorts of weird things, like old torture mechanisms, just bizarre stuff. I think this falls into the same category. It had this outlaw-chic thing about it that attracted me right away. When I started seeing these really opulent pieces made from the best materials that were known to man back then, like ivory, rhinoceros horns, silver, or jewels, it seemed to sum up the hedonism of that world. What I’m most attracted to as a collector are the most opulent examples, because of the decadence they evoke. Collectors Weekly: How did you first get into opium antiques? 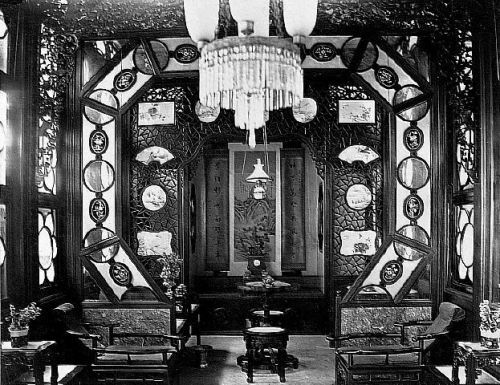 A luxurious and ornately decorated opium smoking room, possibly inside one of the “flower boat” that could be hired for a night of opium smoking on the Pearl River. The opium bed is at the back of the room. Circa 1880. Martin: In 2001, I was working as a fixer and translator for a good friend of mine, Karl Taro Greenfeld, a journalist for the Asian edition of Time. He wanted to do a story about the remnants of opium smoking in Laos, which, at the time, was the only country in the world where you could see opium smoking in the traditional Chinese manner—that is, with a pipe that’s designed to vaporize the drug and a lamp as a source of heat and all the crazy, little tools and accoutrements. Through some weird quirk of history, this sort of opium smoking was eradicated every place else, but Laos still had the traditional public opium den that anybody could walk into, recline, and have an attendant prepare opium for them to smoke. 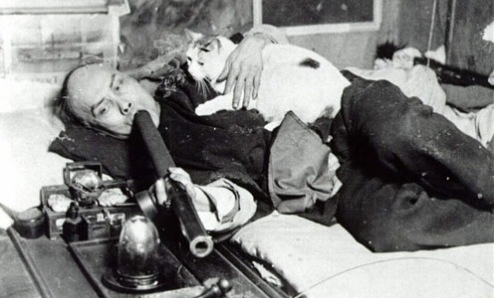 This photograph of a Chinese man smoking opium with his cat in San Francisco became a best-selling souvenir postcard. That night at the hotel, I had what I like to call “a collector’s epiphany”—that moment when you say to yourself, “Why am I not collecting this stuff? It’s really cool.” From that time on, I started looking everywhere for opium items. My writing jobs took me all over Southeast Asia, but I was really surprised to find just how scarce it was. There were plenty of reproductions out there, but was very difficult to find authentic pieces. Collectors Weekly: Was your first pipe a reproduction? 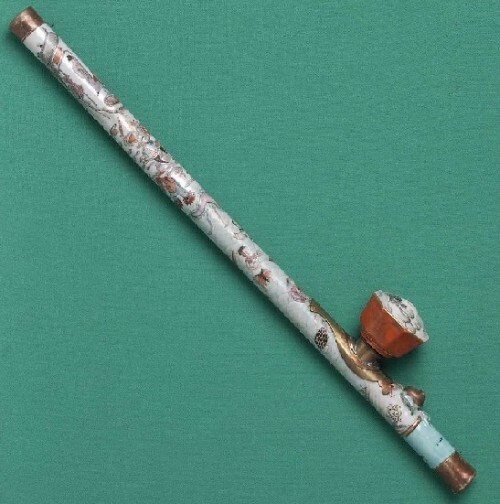 A rare opium pipe with a porcelain stem. Only a handful of these pipes survived anti-opium eradication campaigns. Martin: As it turned out, it was. But I didn’t know it at the time. Suddenly, I had the bug to start collecting. I started with opium pipes but eventually collected opium paraphernalia in general. The more I dug around, the more surprised I was to find out that there just wasn’t any information about collecting these things. I started looking on the Internet for books about it. You know how collecting is: Chances are somebody’s written a book about your particular field. But all I found were a couple of articles in a Hong Kong-based magazine called Arts of Asia. As I learned later, one of articles about opium pipes was just completely wrong, with all kinds of bad information in it. It really put the bite in me, this particular collectible. If it were something else, maybe I’d have given up on it. The fact that there was nothing written about it drove me. It was a challenge. I thought, “Well, if nobody knows anything about this, then I’ll teach myself, I’ll figure it out.” Through trial-and-error, I developed an eye for what was what, and realized no one else was really collecting this. Even now there are only a handful of opium paraphernalia collectors—fewer than 10 serious ones. 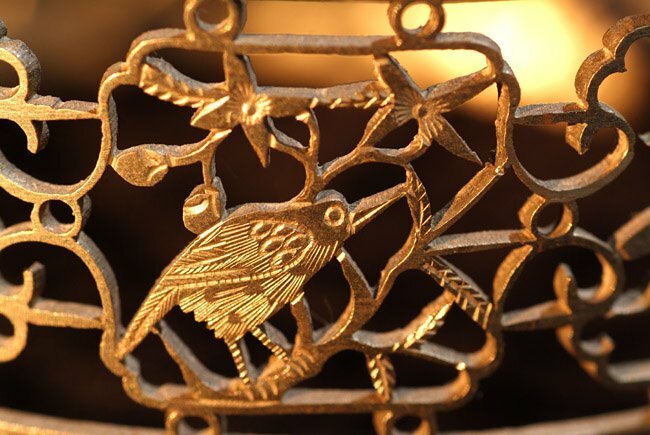 A brass opium lamp with openwork in floral and bird motifs. The threaded base indicates this lamp once had a lid to protect the glass chimney when it was not in use. By chance, I discovered there were quite a few pieces on eBay. The strange thing was, none of them were coming out of Asia. Mostly it was from U.S. sellers—a bit of it was coming out of the U.K. and Canada, and there was a fair amount from France. In addition, the sellers weren’t listing their items as opium paraphernalia. 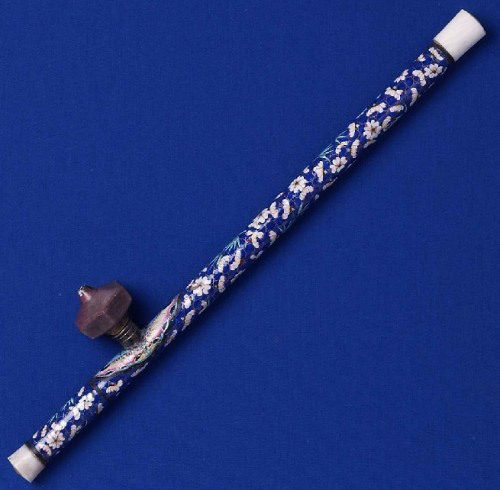 They usually didn’t know what they had, so they’d list a piece as, say, “oriental pipe” or “Asian lamp.” I started bidding on these things, getting them for ridiculously cheap prices because nobody else was buying them, like under $10 for like a really beautiful, ornate lamp, or $20 for a beautifully crafted pipe. For three or four years, I pretty much had the field to myself, and I was able to build a sizeable collection in quite a short time using eBay. I amassed more than a thousand pieces, including about 40 to 50 opium pipes, and more than 100 opium lamps, and all kinds of examples of all the little tools. Collectors Weekly: What are the tools for? Detail of Martin’s old opium-smoking layout, photographed in July 2007. Martin: During the heyday of opium smoking, hundreds of little tools were crafted specifically for the preparation, vaporizing, and ingestion of opium. That stuff had just been completely forgotten. During the turn-of-the-century eradication campaigns, it was heaped into piles and burned. Nobody bothered saving anything for posterity. It was seen as this really evil habit and not worthy of being documented, with a couple of exceptions. 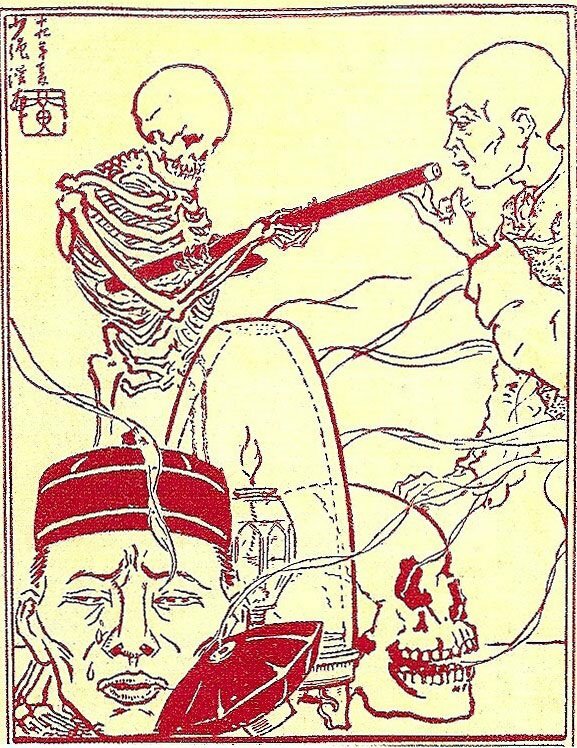 One was a book published in 1881 called Opium Smoking in America and China. It was written by a New York doctor named H.H. Kane, who spent years researching the opium dens in Manhattan. It was the best book about opium smoking I found, until I wrote my own. In fact, almost all of the information I got about opium smoking and the accompanying paraphernalia was from old books, from 1920 and earlier. 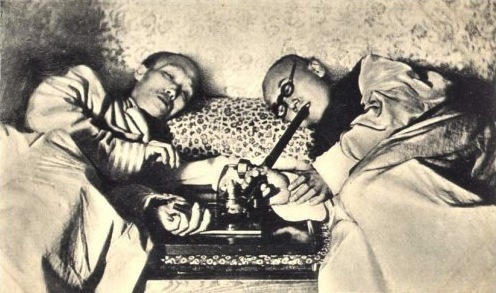 Two opium smokers in a Shanghai, China, den in the early 20th century. It took a while to really understand what I had. At first, of course, there were these opium dens in Laos that I could get to quite easily. Vientiane was an overnight train ride from Bangkok, where I was living. I would take tools up to the opium dens and see if the old smokers there knew what they were. Often they did, although they hadn’t seen some of the pieces in years and years. They would show me how a piece was used. For example, a lot of different tools are used as rolling surfaces, as they call them. When you’re preparing opium for a pipe, you form it into a little pellet of opium on the end of the what’s called an opium needle, which is just a skewer, basically, because you can’t work the stuff with your fingers; it’s too hot. 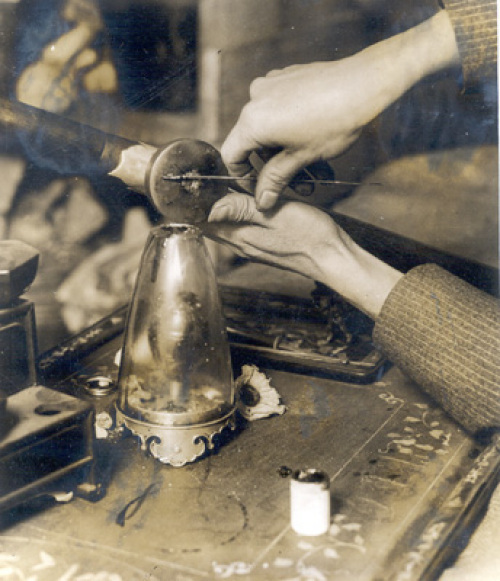 There are lots of different tools for rolling the opium pill, as they call it, into the correct shape before inserting it onto the pipe bowl. That’s why I started hanging out in these opium dens, to learn what I had. Then I started experimenting with the drug. Opium’s really odd. With modern drugs, you take a single hit and you’re hooked for life. You’ll think of nothing else. Opium’s the exact opposite of that. It takes years and years to get addicted. But once it gets its hooks into you, it’s really difficult and painful to get off. Collectors Weekly: How did opium affect you when you first tried it? Detail of the vent of a lighted opium lamp. Martin: Opium tends to make you nauseated if you’re not used to it. So the first few times I tried it, a lot of vomiting was involved, and I thought, “Well, this isn’t so cool, but I’m interested in watching.” I did that until 2002, when the last of the opium dens—there were two left—were closed by the Laos government. 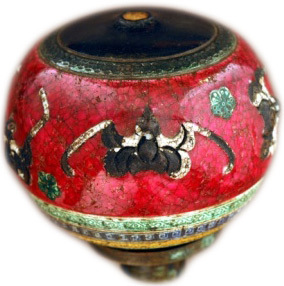 A rare pipe-bowl from the early 19th century adorned with red glaze and bats, both symbolic of happiness. Then I met an expat from Austria, who was able to get opium that had been prepared specifically for smoking. This is a reason why opium smoking will never come back. First, the paraphernalia is so bulky and easy to identify that there’s just no way you can hide an opium pipe and lamp under your jacket and take it around with you. Secondly, while tons and tons of opium is harvested every year in places like Afghanistan and Burma, it’s all going straight to heroin. There’s just no demand for chandu, which is what they call opium that’s been prepared specifically for smoking. However, this Austrian was somehow able to get enough raw opium to prepare his own chandu for smoking. And I had this bright idea—bright at the time, I thought. I said to him, “Well, you’ve got this high-quality opium for smoking, the type that isn’t even being produced anymore. You’re the only one that’s got it, and I’ve got all this great, old paraphernalia, some of it in pristine condition.” So I asked him if he’d be interested in combining the two. Over the next few years, he and I collaborated. I’d go out and visit him every month or two in the rural area where he lived, and he set aside a room in his house specifically for smoking. We decorated the room with Chinese antiques like scrolls and a traditional opium bed. Collectors Weekly: So you made your own opium den? Opium smoking in Denver, Colorado, in the late 19th century. Walls of opium dens were usually covered to prevent drafts that could cause the lamp to flicker. Martin: That’s exactly what we did. I was going through books and getting ideas, and we tried to make it as authentic as possible. As I was still collecting and still getting different pieces of paraphernalia and pipes, I would bring them to his place and we would try them out to see how they worked. In old books, we’d read about how some of the old smokers preferred a pipe whose stem was made of sugarcane to one made of bamboo, while others preferred bamboo to a pipe made of ivory. The old books said this, but why? That’s what I wanted to know. I was smoking so infrequently that I felt it was research. That’s how I justified it. He and I smoked every month to two months. Everything seemed fine. I started to believe that the alarmist vocabulary you find in the old books about the evils of opium was just completely overblown. I had been smoking for years and still wasn’t hooked. 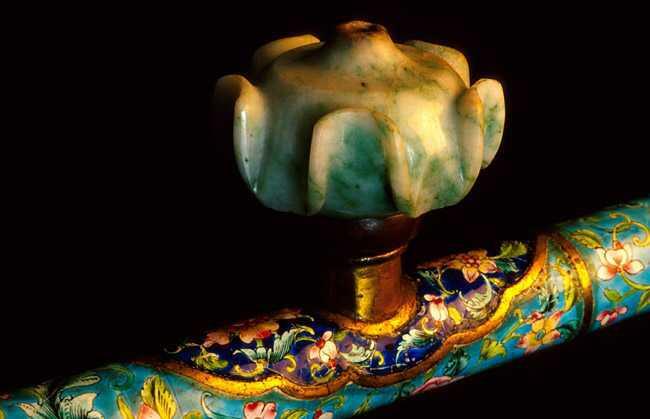 A close-up of an opium pipe of featuring Canton enamel and a jade bowl. Then my Austrian expat friend introduced me to another expat, an older American woman named Roxanna Brown. Originally from Illinois, she had gone to Vietnam during the war and had become a journalist. She ended up staying in Southeast Asia, marrying a Thai man and having a son. She became an expert on Chinese and Southeast Asian ceramics. And she was also an opium addict, smoking every day. Because she lived in Bangkok, that led me to more and more frequent experimentation. Again, opium smoking is very involved, very time-consuming. At first, that’s what I was attracted to, the whole ritual aspect of it. But then I started bringing the stuff to my apartment. That’s when things went crazy. I went from smoking opium a couple of times a week to round-the-clock. I tried getting off the stuff, but couldn’t. It was just impossible, so painful. I ended up checking into a Buddhist monastery a couple of hours north of Bangkok that specializes in treating people with addictions. They have this potion they claim came to a Buddhist nun in a dream. You drink it, hold it down for a few minutes, and then start vomiting it up. You do that for five days straight. Somehow, it made the withdrawal symptoms maybe a quarter of what they were when I had tried to quit on my own. I’ve got nothing but good things to say about that monastery. For a time, I was actually able to get off the stuff. Collectors Weekly: Why is opium smoking so addictive? Left, a late 19th century earthenware pipe-bowl decorated with the character denoting longevity and the “endless knot,” a Buddhist symbol. Right, a pipe-bowl in the shape of a Buddhist deity. Martin: You go through this period where it’s just unbelievably good. You just think, “I’ve discovered this great, little secret that nobody knows about.” And then at some point, it just turns the tables on you. You go from looking forward to it to absolutely needing it. It’s insidious the way it plays with your brain. It just makes life without the pipe, without the intoxication, seem really brutal and pointless. You get to the point where you can only relate to your smoking friends. I got to this stage, and at the same time, I also realized that the only way I could afford to keep buying opium—at this point I was buying it through Roxanna, and it was very expensive—was to sell off bits of my collection. Now my twin obsessions were going head-to-head. I had to choose one, and I chose the collection. 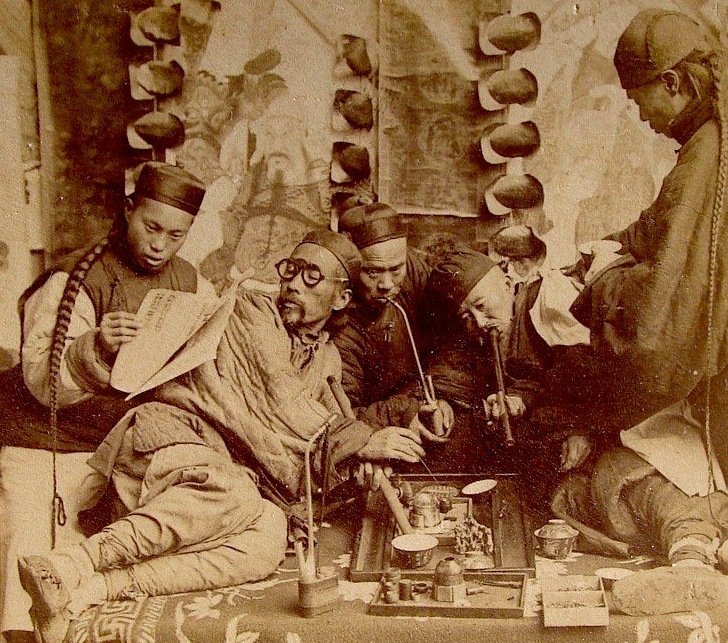 This photo depicting opium smoking in Canton, China, was posed in a studio for a stereoview card, circa 1900. But the story doesn’t really end there. After kicking the habit, I had a relapse and started smoking with Roxanna again. Then, in the spring of 2008, she had an engagement to give a talk about Asian ceramics at the University of Washington. Apparently, she was also being investigated for antiquity smuggling, which was something I didn’t know anything about. They arrested her on a Friday at her hotel in Seattle. Early Wednesday morning, they found her dead in her cell. I’m pretty sure she died from the withdrawal of the opium. It’s so horrible, the withdrawal. It’s not like anything else. According to the old books, it used to kill people pretty violently. After I heard what happened to Roxanna, I quit right away and started writing the book I had been researching for years. For lack of a better niche, the publishers have been marketing it as an addiction memoir. Yes, there are parts of it that are similar to addiction memoirs, but it’s really much more about collecting. About a third of the book has to do with the addiction. A third of it’s probably opium-smoking history, not just in China but in North America, too. And then another third of the book is pretty much all about collecting in general, at least through my eyes. Collectors Weekly: What are the origins of opium smoking? A rare opium pipe adorned with Canton enamel. Within the enamel-covered copper sheath is a peeled stem of bamboo. The endpieces are white jade, and the hexagonal pipe-bowl is ceramic. Martin: The interesting thing about opium is that until the Chinese invented this system for vaporization—sometime in the 18th century—there was no pleasurable way to ingest opium. People were eating it. People were smoking it, mixed with tobacco. But eating it causes really bad side effects, the worst being constipation for weeks. And burning it destroys certain alkaloids in the opium that make the intoxication enjoyable. Then a Chinese inventor whose name is completely lost to history came up with a system for vaporizing it. That invention opened the door for opium to become a recreational drug. Suddenly, all the bad side effects were lessened. Vaporizing opium takes out a lot of the morphine content, which is the thing that makes you feel stupefied and out of it. Good-quality opium, smoked with the proper accoutrements, is energizing. It doesn’t put you on the floor. Well, you’re lying on the floor to do the actual smoking, but that’s just because it’s the most comfortable position to hold the pipe over the lamp. That’s the only reason the old photographs of opium dens show people lying down. It wasn’t because it made them so stoned they couldn’t stand up. 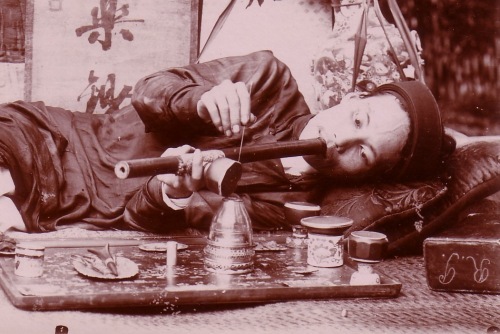 A rare close-up photograph of an opium smoker preparing a “pill” of opium for the pipe. The photo is said to have been taken in New York City in the 1920s. That’s another reason why opium will never come back—it’s difficult to prepare for the pipe. It takes a lot of practice. Most people, even the addicts, couldn’t do it themselves. They’d go to an opium den where attendants would prepare the pipes for them. It was not so much to meet and gather with other opium smokers. A wealthy smoker would’ve had a private opium den and a personal pipe boy to deal with anything having to do with opium in the household. Collectors Weekly: What were the Opium Wars about? This photo depicting opium smoking was posed in a studio for a stereoview card, circa 1900. The British were into tea, which they were importing from China. But the Chinese would only accept silver as payment for the tea, and they weren’t interested in any of the stuff the Brits brought to trade. As a result, the silver coffers in London were quickly being depleted. And so the British were looking for something they could trade with the Chinese, and opium was what they hit on. Before that, opium smoking in China wasn’t really a problem because there was so little of it. The people who were smoking were mostly the elite. It wasn’t until the British came along and started dumping it on the market that suddenly everybody could afford it. Once it became really apparent how many people were getting addicted to it, the Chinese government tried to put a stop to it. That’s what led to the Opium Wars, between 1839 and 1860, and also led to the British colony at Hong Kong. Opium smoking layout including a solid ivory opium pipe. Not only did you have a lot of people addicted to it, but you also had a lot of Chinese who were complicit in the opium trade, who were making paraphernalia or running opium dens. With China as corrupt as it was, it just became impossible for the government to enforce any of its new anti-opium laws. It wasn’t until the U.S. decided to make a cause of it at the turn of the century that opium use really started to decline. Collectors Weekly: And opium smoking had spread to the U.S., too? 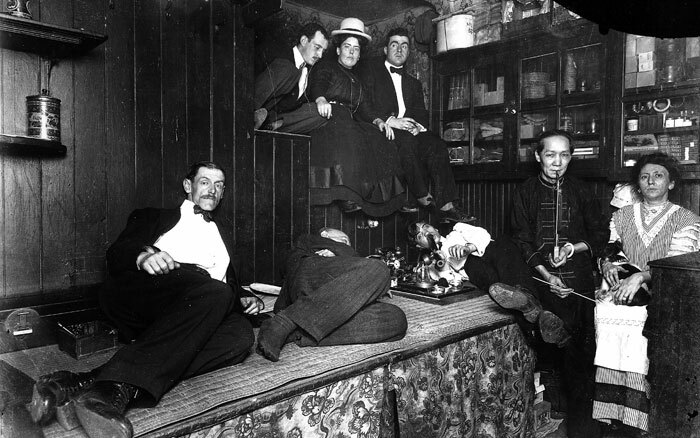 Americans smoke opium in a Chinese-run opium den in New York City in 1925. Martin: The Chinese who came to California for the Gold Rush brought opium smoking to this country. But opium itself was here before they arrived, as an ingredient in patent medicines imported from Europe. The Chinese did not bring opium to the States, but they did introduce a very efficient system for using the drug recreationally. Because Chinese workers were isolated in Chinatowns when they first came here around 1849, it took about 20 years for opium smoking to catch on with non-Chinese. You don’t read about instances of non-Chinese smoking opium until the late 1860s. The first American citizens who smoked were people who were hanging out in Chinatown, like gamblers, petty criminals, and prostitutes—they were the first ones who got hooked. In turn, they got their friends into it, and by the time of the earthquake in 1906, I’m sure some wealthy white San Franciscans had their own opium-smoking rooms in their houses. Once it caught on with Americans, it spread east very quickly, along the railroads to Chicago, New York, and eventually, New Orleans. According to H.H. 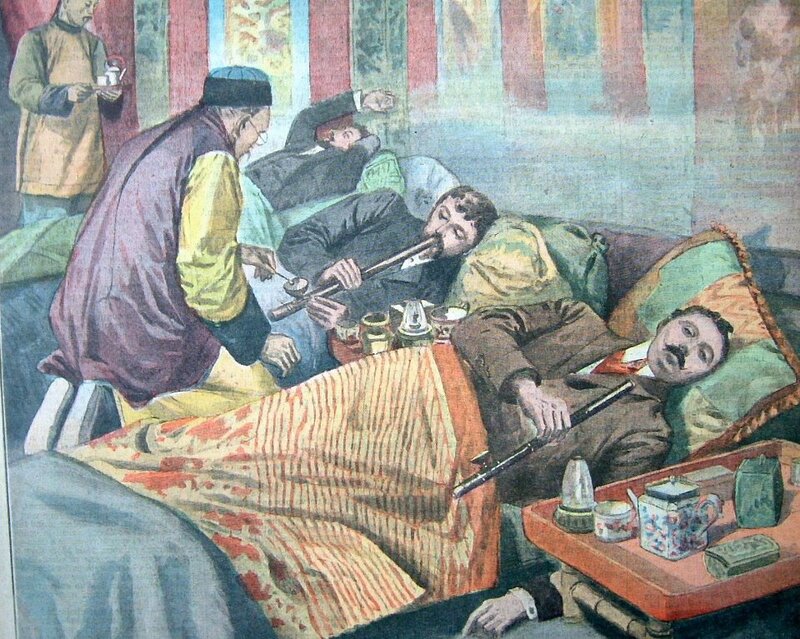 Kane’s 1881 book, people didn’t travel around with their own opium pipes, so they had to rely on opium dens. By that time, there were hardly any cities in the eastern United States, and certainly none in the West, that didn’t have an opium den. Often it was just a back room in a Chinese laundry. Collectors Weekly: Was opium smoking already common in Europe? A detail of a cover of “Le Petit Parisien” magazine from 1907 depicts opium smokers in France. Martin: Not necessarily. The only place in Europe where it caught on was France. Unlike in America, foreigners didn’t bring opium to France. The French brought it there themselves from their colony in Indochina. I think the French were a little bit more open than the British, and were more likely to go into a place like an opium den in Indochina and smoke with the locals. From what I can tell—and I base this on the paraphernalia I’ve collected and also the photographic evidence—there was no opium-smoking scene in London. For some reason, though, people think there was an opium-smoking scene in London, but that perception is based on fiction. Sir Arthur Conan Doyle, Oscar Wilde, Rudyard Kipling, and Charles Dickens wrote about opium smoking in their novels. But if you read the way they describe opium smoking, without a doubt these people never saw the real thing. It’s laughable. Even back then, Kane took Dickens to task for his woefully inaccurate depiction of opium smoking. What we see in movies, even to this day, with the obligatory London opium-smoking scene is complete fiction. Collectors Weekly: Why did the United States get involved with opium bans in Asia? 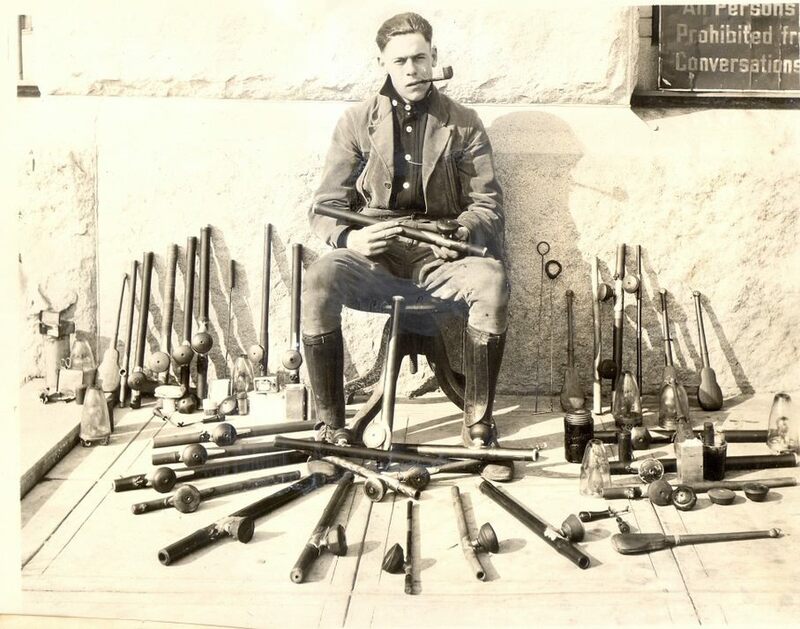 A police officer poses with opium pipes, opium lamps, and other paraphernalia confiscated at opium den raids in San Francisco. Martin: A lot of the countries back then had opium monopolies and were selling opium in licensed dens and making revenue from it, especially the European colonies in Southeast Asia, like the French in Indochina, the British in Burma, and the Dutch in Indonesia. The only colonial power in Southeast Asia that wasn’t making money off it was the U.S. When the U.S. took over the Philippines in 1898, one of the first things our government did was to ban opium and crack down on it. A lot of the opium paraphernalia I found in the States on eBay probably belonged to missionaries, who used these pieces as props when they went on the talk circuit to raise money for their mission. They’d buy a lot of the most opulent pieces in Asia, but they were obviously never used. 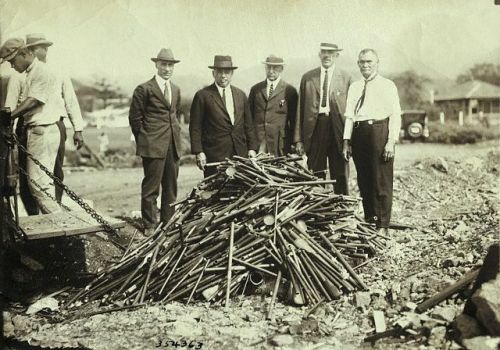 Confiscated opium pipes in Hawaii are piled up and readied for burning in this photo, circa 1920. When the government finally banned opium within the United States, with the Harrison Narcotics Act of 1914, they used the Philippines as an example, because the U.S. had already been fighting opium smoking there for more than for 10 years. One of the best techniques the authorities had to eradicate opium was to pile up all the paraphernalia they could find and set it on fire. I’ve got old pictures of opium-paraphernalia bonfires in San Francisco. They used to do it every few years. Coincidentally, the Germans had started selling heroin around 1898 as a cough remedy. It was also used as a cure for opium addiction. Once heroin became popular as a recreational drug, it was much more difficult to eradicate since it’s so much easier to hide. So that’s what happened to most opium smokers: If they didn’t quit altogether, they went on to heroin. That’s another reason why opium smoking disappeared. Collectors Weekly: You consulted on “Boardwalk Empire” for its opium-smoking scene. How wrong does Hollywood get opium? 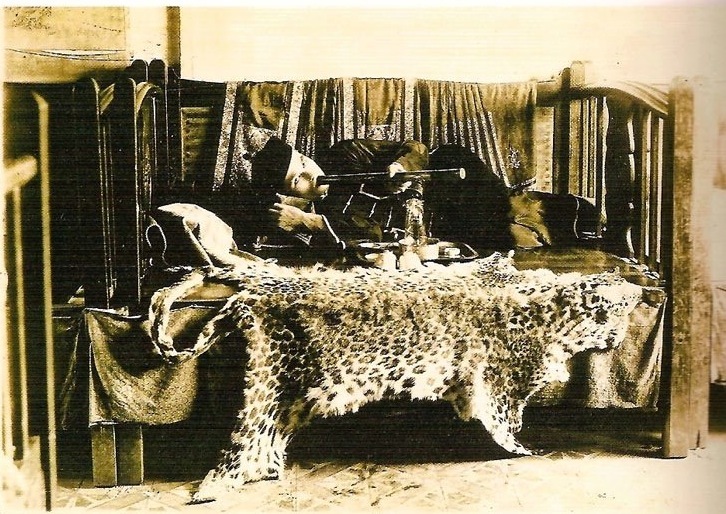 Collectors Weekly: Why did they have beds in opium dens? 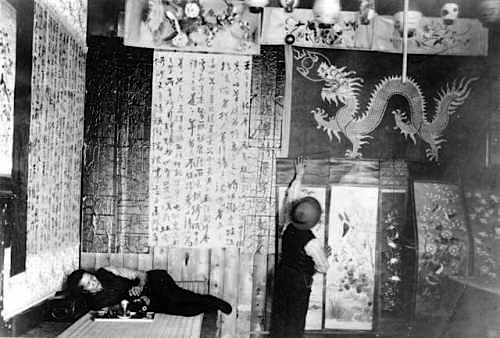 A Westerner poses with an opium smoking layout, circa 1900. Martin: The beds were designed to give people privacy and reduce the drafts that would cause the opium lamp to flicker—they had partitions on three sides. Also, when you’re smoking opium, you find it’s very pleasurable to be in quiet, dimly lit places. You want to get away from things that are loud and noisy. For a couple of months, I wouldn’t leave my apartment. I couldn’t face people, even to order food. Life just seemed more hideous than it already is. It’s weird how opium turns the tables on you. Collectors Weekly: What is a flower boat pleasure craft? Martin: Those were in Canton, specifically. Back in the day, opium smoking was popular at Asian bordellos, as men believed opium gave them staying power. The flower boats were very opulent boats. You’d rent them and go out on the Pearl River. You could spend a night or days on the boat smoking opium, and the women attendants would, basically, cater to the client’s every whim, from sensual massage to food. 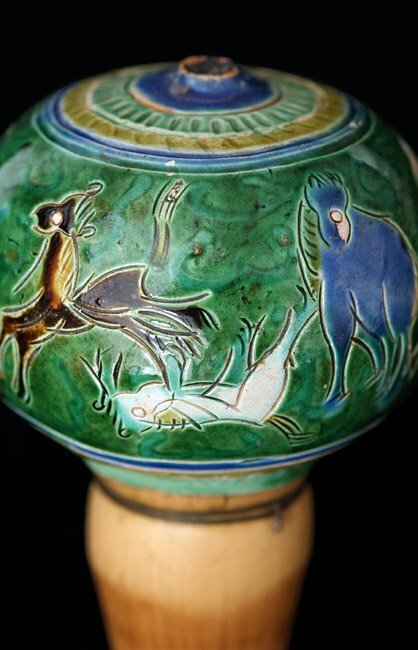 Collectors Weekly: What distinguishes an opium pipe? A glazed opium pipe-bowl from the early 19th century. Martin: They’re long because you’re using an oil lamp as a heating source, and you need some space between yourself and the heat. Pipes are adorned with things like tortoiseshell and shagreen, not only to make them pretty but also to give them texture. All sorts of opium paraphernalia was made to excite the fingertips because it heightens the senses. On opium, touching things that are of a strange texture is actually enjoyable, so they designed paraphernalia with this in mind. When it comes to the decorative aspects, the ornate and intricate little designs would hold your attention so you could just get lost in them. Collectors Weekly: But most of the pipe bowls look like door knobs. Martin: Yes, the most common are shaped pretty much like a door knob, but some of them are figural, shaped like crabs and other things. They made pipe bowls from all kinds of different materials, but for the most part they were earthenware or stoneware, usually the reddish brown Yixing clay that the Chinese used for teapots. That was really popular for pipe bowls for the same reason that it was popular for teapots. The Chinese believed that every time you steeped tea in a Yixing pot, the residues of that tea got into the porous surface inside. The idea was, every time you steeped tea in this pot, you were getting closer to a perfect cup of tea. They felt the same thing about opium pipe bowls, that every time you smoked high-quality chandu through one of these Yixing pipe bowls, you were getting closer to the perfect smoke because the ceramic was absorbing the residue. Sometimes the outside is glazed, but the insides are always unglazed. Collectors Weekly: What about the lamps? This opium lamp with extensive cloisonne ornamentation was found in New Orleans. Martin: The Chinese went all out when it came to decorations on the lamps, the Vietnamese, too. In an opium den, your oil lamp is usually your only light source. All paraphernalia was made with lots of little facets and angles to reflect this lamp light. It all seems so magical. In fact, that’s the thing you really miss after you’ve quit smoking—the damn lamp, it’s just so beautiful. When you’re in a dim, quiet room curled up around your lamp, it just makes all your problems go away. 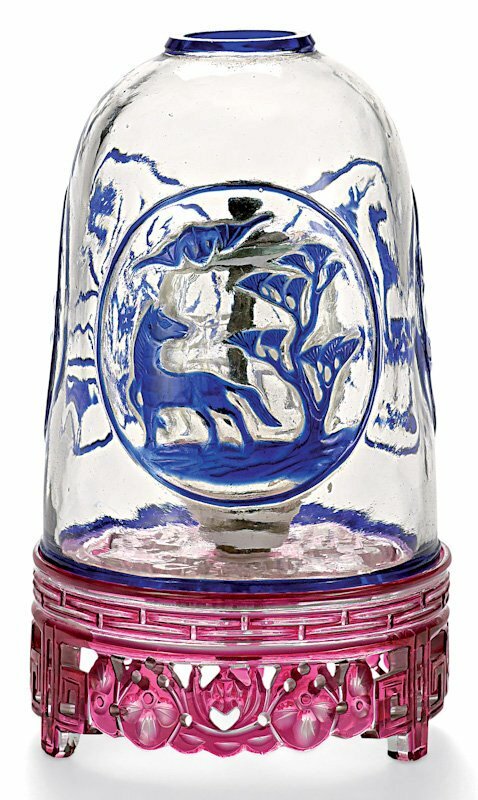 The nicest one I’ve got in my collection is made of blue and clear Peking glass that’s been very minutely carved into birds and floral scenes. Collectors Weekly: What advice do you have to someone who wants to collect opium-smoking antiques? Martin: Be very careful. Take what the dealers are offering with a grain of salt. Dealers aren’t always trying to rip you off, but a lot of times they just don’t know what they’re talking about. I’ve had people swear up and down that a piece is opium-related when it’s not. Read as much as you can about it before you buy. 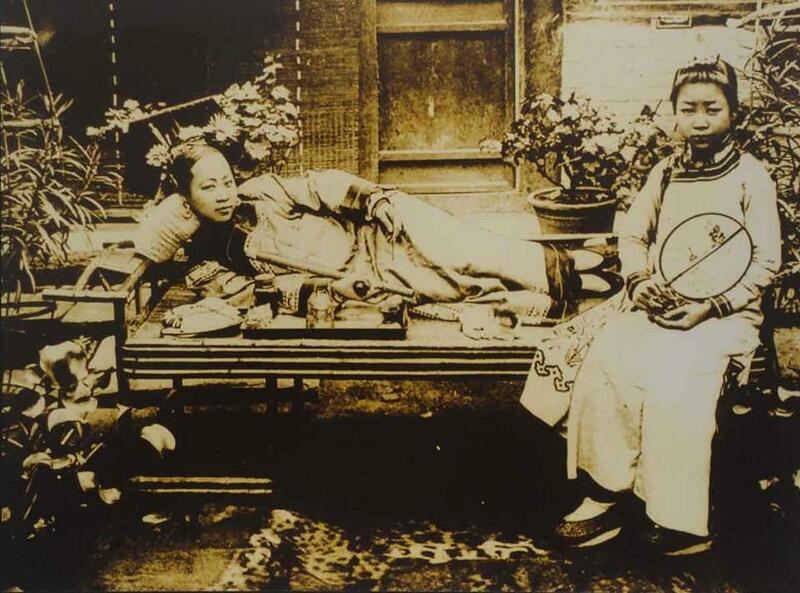 Women smoking opium in China, circa 1900. 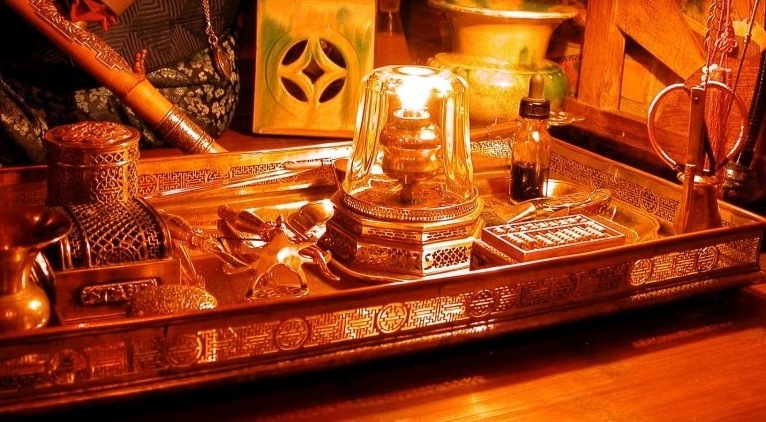 When it comes to opium-smoking paraphernalia, the chances of finding something really worthwhile in an antiques shop, especially in a place like Paris, is very slim. You’re more likely to find a good piece in somebody’s attic. Maybe the great, great grandfather was an opium smoker and the stuff got put away and forgotten. That’s the kind of thing I found on eBay. People who fly to Asia looking for opium antiques are going in the wrong direction. It’s here. Collectors Weekly: Don’t most of the opulent pieces belong in a museum? 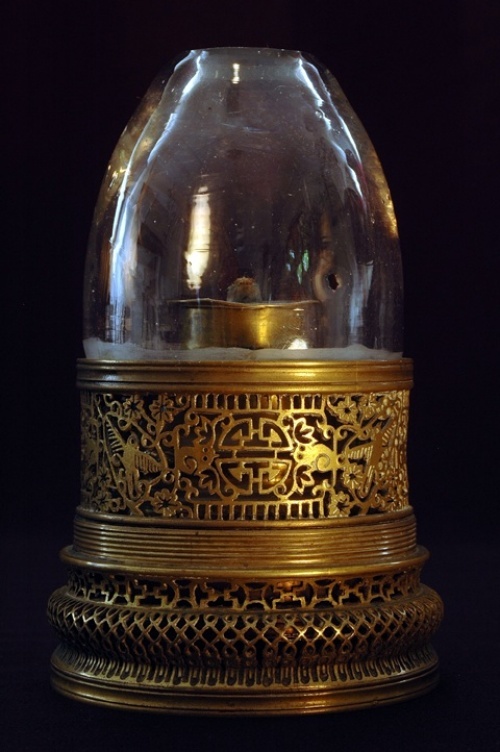 An antique opium lamp made from Peking glass. Martin: Probably. I’m hoping at some point museums will get interested in it so that I can help them. I just donated my collection to the University of Idaho as a result of seeing other collections scattered to the winds once the owner of the collection died. If somebody’s got a collection of opium paraphernalia, the family often isn’t interested. The pieces end up being resold back to dealers who, in turn, sell them again. After seeing this sort of thing happen over and over, I hit up on the idea of finding the institution that would take the collection from me with the promise that they’d keep it together for scholars and researchers. What drew me to the University of Idaho was their anthropology department, which has done archaeological digs in the Western U.S. where Chinese had been living, in places like railroad camps and mines. 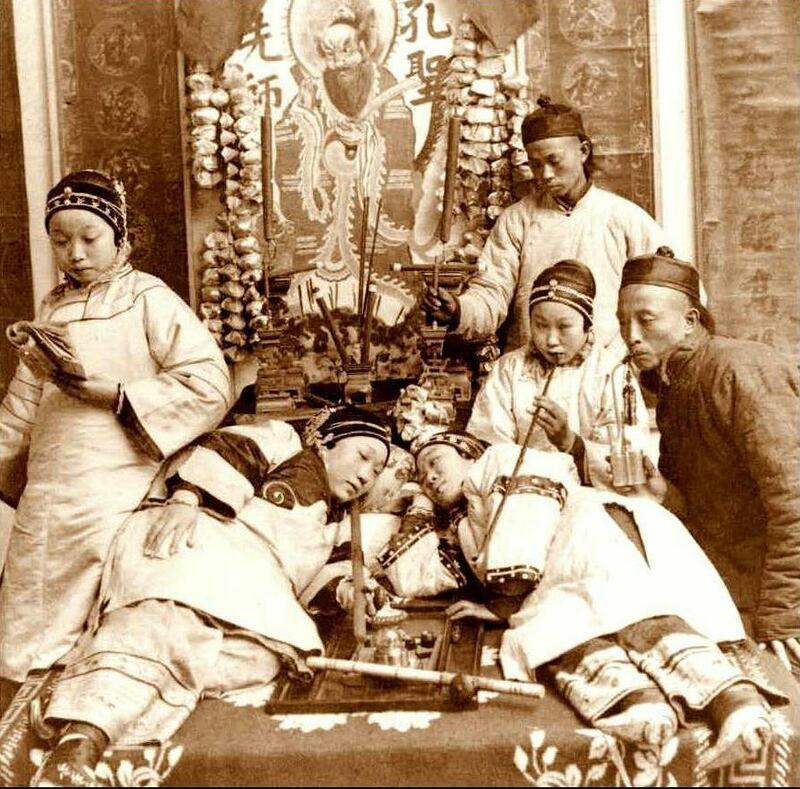 Wherever you had a Chinese population in the 19th century, at least half of them were opium smokers. The university found a lot of paraphernalia in these digs. Nothing very opulent, and most of these things are broken, but I was impressed by how much they were able to learn from all these little shards they were finding in the dirt. Collectors Weekly: Do you think this sort of stuff is dangerous to collect? 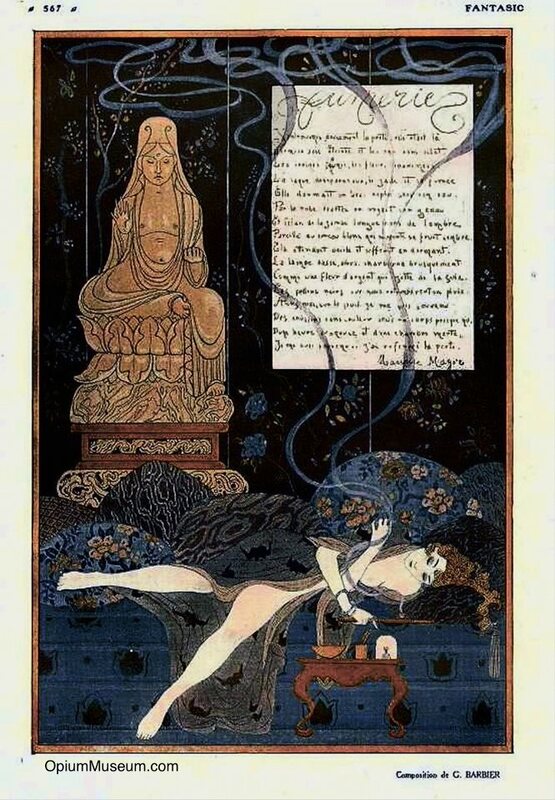 A highly romanticized illustration of a woman smoking opium, by George Barbier. From the French magazine “Fantasio,” 1915. Martin: Yes, but again, I think the obsessive-compulsive behavior that goes along with collecting as a whole can get people in trouble if it’s directed at the wrong thing. However, I don’t speak for anybody but myself in the book. Obviously, if you’re going to start collecting something that’s related to an addictive substance, you’re playing with fire. I’ve met collectors of opium-smoking paraphernalia who have never tried opium and have no interest in it, but they seem to be the exception. Most of the opium collectors I’ve met, who I know well, if they can smoke opium, they will. But again, it’s so difficult to find. It involves a trip to Asia, and knowing the right people. But if you flew to Thailand right now and spent all your money and time trying to find opium to smoke, I guarantee you’d be disappointed. The people who are still doing the sort of thing I was doing have no reason to tell anybody else about it. All images are courtesy of Steven Martin. To learn more about his books and collection, check out his Opium Museum web site and “Opium Fiend” Facebook page. There is one mistake : when you say it takes years to get addicted to opium as opposed to modern drugs “you get instantly hooked on”. It all depends on your affinity to the substance. I have taken various drugs, amongst which heroin for over a year, and I never was addicted to it. I stopped it without so much as a shiver. No pain, no loss of sleep, nothing. And I injected it every day, as you’re supposed to do if you’re serious about it. Other people will be addicted very fast whereas for others, it might take years. More than the substance, it depends on each person’s response to it. A friend of mine smoked tobacco for years before he finally got addicted. As for me, alas, the first pack got me… to this day. I still can’t quit. I have an affinity with tobacco, not with heroin. Another friend of mine had an affinity with heroin, which killed him. Of course, the best way is never to find out if you have defenses against this or that drug. Strong as you may be, you might not. Well, that’s prety comprehensive – my experiences were mostly in Bombay in Arab Gully just off Sukhalaji Street. I don’t agree with the bit about it ‘motivating’ you. It just motivated me to stay there and read all Graham Greene’s books (and Solzenhitsyn and loads more). It’s a long process to make opium int changdhuy, and, indeed, there is opium which is not ‘chandhu pass’ as Mukham (the boss) said it. I knew people in London who had O and a friend with a pipe, but we got very little that was Chanhu pass. I still love it better than smack and miles better than morphine. I’m clean now, unfortunately, but get 10 grams of morphinre from mty quack cos I’ve got cancer. That’s it – happy daze! One more thing I forgot ( apart from the spelling and grammar!) is that there is no way you can smoke raw opium – some girl said you can – but the best you can do is drop it on a red hot spoon and inhale the fumes – otherwise you’re wasting your time – just be an ‘English Opium Eater’ like myself! And Wordsworth Keats and Shelley! To the superhero who magically shot dope, daily, for over a year, without a hint of withdrawal… Um, yeah… But you find you are physically addicted to tobacco? Allow me to assure you, as a veteran Heroin addict and cigarette smoker for over twenty years… When I find myself periodically without access to either substance, such as in jail, which goes with the territory, it doesn’t even occur to me that I would like a cigarette – proving it’s otherwise easy access and subsequent psychological grip has some value, but physical? No. Now, heroin… Too much could be said here, ad nauseam (pun intended)… So I will simply say that you, my friend, managed to consistently purchase straight bunk dope for over a year, if there is any truth to your statement. The opiophile in me was delighted reading this article. Shattered a lot of my misconceptions about the history of opium use. One thing though; death by opium withdrawal? I don’t buy it. Opium withdrawal is just like any other opiate withdrawal, and many of the opiates that people use recreationally today push your tolerance way further than opium ever could. I’m reasonably certain that the consensus today is that opiate withdrawal has never and cannot kill somebody. Great article. Just wanted to make a related comments. Opiates work on the MU receptor -they have a different effects on different individuals. The primary two effects are lethargy and energy. All opiates work this way on the brain and all opiates burn (or waste) fast when heated-but smoking it is the fastest route of administration as it break the blood/brain barrier easily. There has been quite a bit of research into the brains of addicts who are energized by opiates as we’ve found they carry the addiction gene. This was a beneficial part of the human race and some would argue that the tribes that used substances to hunt/gather-well those tribes survived through natural selection. I also want to note to the above posters that stereotypes and lack of empathy are keeping our addicts circling the drain. Just bought your book based on this fascinating article! As a fellow obsessive collector I can relate. First off, Great read. I enjoyed it very much so. Even though I am in medicinally assisted recovery for opioid addiction, the opiophile in me Loved it. I did notice some incorrect statements made in the article and in its subsequent comments. A lot of the “opium” people speak about now-a-days is really just black tar heroin. Any substance that is a potent gaba agonist, like alcohol and benzodiazepines, but also including others, can cause death from withdrawal. Heroin withdrawal is a horrible, using the word to its fullest, experience. But, as already stated, unless someone has a very bad underlying medical issue that opioid withdrawal exacerbates, the withdrawal will not kill you. ( I mean maybe if someone worked up a multiple time per day gram of etorphine and or crazy poent fentanyl analog IV habit they could die solely from opioid withdrawal, but I have yet to see it ) Also people can become mentally and physically addicted to potent opioids from less then a week of steady use, but no one gets physically addicted their first use. Also, on the other hand, unless you are a scientific anomaly no one can shoot heroin daily for a year without getting addicted. One more thing, the withdrawal from eating opium, making tea from the dried poppy plant, etc is a lot worse than the withdrawal from heroin. I lived in Chiang Mai during the years that Steve Martin did, but do not recognize him. I kind of doubt one can die from Opium addiction. Methadone is the only opiate that kills addicts going cold turkey. When I lived in Thailand we used to go up in the mountains and smoke opium with the hill tribes. They used s proper pipe. But I doubt if they were smoking “chandu”. They had a reddish opium they called number one and a black type that was mixed with scrapings from the pipe and aspirin. It was less expensive than the reddish type. Also tried China White heroin a few times, but never got hooked on either one. I knew of Roxanna Brown and visited her restaurant a few times, but did not pay her much attention. Steve Martin tells some stories in his book that make me wish I had picked her brain. Exactly how is an opium pipe used ? Do you put the opium into the bowl then place the bowl over the lamp? If the bowl was on the top of the long pipe stem ,would it not burn up? Would you put the opium into the bowl then turn the bowl sideways? I don’t see traces of burn marks on any of the bowls , just around the little hole on top . I read that they made a pea shape of the opium then put a needle through it and held the needle close to the flame to get it to smoke, surely there is a more efficient wat of smoking opium. One last question. Today the kids are ” vaping” apparently the product isn’t burned , but just heated. How would this work with raw opium?